The addition of cornbread means this tasty appetizer does double duty as comfort food and fun party fare. Preheat oven to 400°F. Line 15-1/2 x 10-1/2 x 1-inch rimmed baking sheet with aluminum foil; spray with nonstick cooking spray. Combine cornbread mix, milk, and eggs in large bowl just until blended (batter will still be lumpy). Stir in cheese and corn. Pour batter into prepared pan. Bake in 400°F oven 20 to 25 minutes or until golden brown. Cool in pan 5 minutes. Run knife around edges of pan; invert cornbread onto cutting board. Cool completely. Cut into rows lengthwise, then rows crosswise to form 12 squares. Cut each square diagonally in half to form 2 triangles. Meanwhile, combine chile powder, cumin and garlic; press evenly onto beef steak. Brush onion slices with oil. Place onions on outer edge of grid over medium, ash-covered coals. Grill, uncovered, 15 to 20 minutes (over medium heat on preheated gas grill, covered, 15 to 20 minutes) or until tender, turning occasionally. Place steak in center of grid; grill 13 to 16 minutes (over medium heat on preheated gas grill 8 to 13 minutes) for medium rare (145°F) to medium (160°F) doneness, turning occasionally. Transfer steak to carving board. Chop onions when cool enough to handle. Combine onions, mango, chopped cilantro and lime juice in medium bowl; set aside. Combine sour cream and lime peel; set aside. Carve steak into thin slices. Divide steak evenly among cornbread triangles. 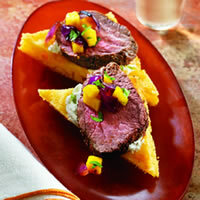 Top each triangle with about 1 tablespoon mango salsa and 1/2 teaspoon sour cream mixture. Garnish with cilantro leaves. Serve immediately. Substitution: One 16-3/4 ounce package cornbread mix may be substituted for two 8-1/2 ounce packages. Prepare as directed above.